Product categories of Battery Smart Monitoring System, we are specialized manufacturers from China, Battery Smart Monitoring System, Battery Monitoring Intelligent System suppliers/factory, wholesale high-quality products of Battery Intelligent Monitoring System R & D and manufacturing, we have the perfect after-sales service and technical support. Look forward to your cooperation! 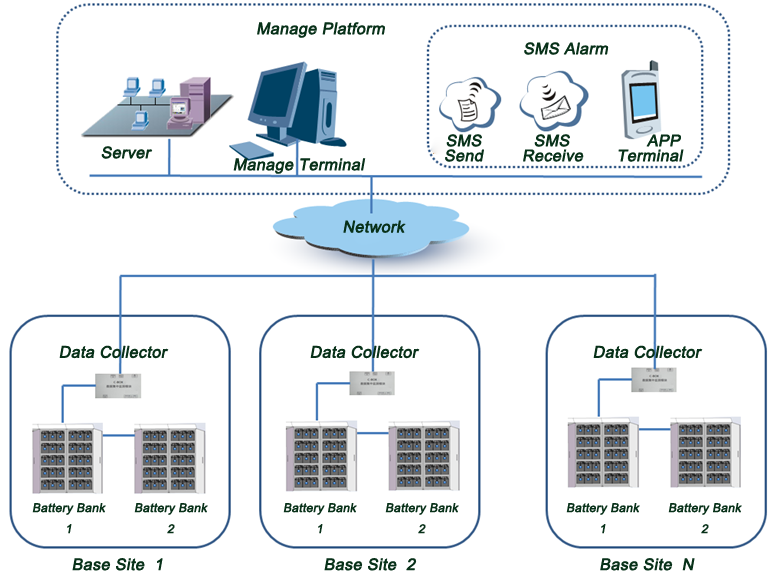 Our Battery Smart Monitoring system is direct integration of the battery restore solution into computer-based battery monitoring system which combines wireless communication with patented, field-proven battery monitor and analysis technology. It not only has the ability to restore battery, but also has the ability to monitor battery's State-Of- Health(SOH) in real time. It is much more intelligent than Smart Pulse Protector and Pulse Restore System because of it's battery remote management and maintenance function with wireless communication. It is comprised of 3 base hardware which consists of a monitoring host, several monitoring modules, and several data box modules. Plus 1 software operation system. The monitor parts connected wirelessly with batteries pack and reliably reports battery State-Of-Health(SOH) to the software platform. The battery monitoring system adopts a inspection module for each battery analysis and monitoring. Through the wireless communication technology, every single battery's SOH data collected by monitor is concentrated into the data box module. The data box module is used to collect the battery's voltage, temperature, internal resistance and current simultaneously. Then transmit all the data to the monitoring host which can do data displaying, analysis, storage, and alarming as soon as abnormal. Since the Monitoring system is integrated with Base Site Battery Protector System, The real-time improvement of the battery equalization and small pulse current desulfation, lead to the battery lifespan prolonged up to 2 times. Meanwhile, monitor battery's State-Of- Health(SOH) and State-Of-Charge (SOC) in real time to make sure keeping the back up power system always safe and uptime.